The better summer beach houses in the Hamptons have nice, narrow, wooden boardwalks to traverse the terrain between the grand summer "bungalow" to the messy shifting of sand on the public beach. 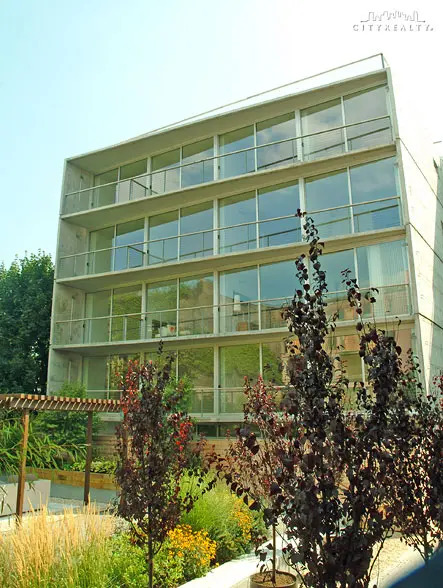 It is a rare commodity in the city's asphalt jungle and it certainly separates this attractive modern low-rise residential condominium building at 580 Carroll Street in the Park Slope section of Brooklyn from the rift-raff. The architecture of the 17-unit building was designed by Enrique Norten of Ten Arquitectos, the well-known Mexican architect who was given a retrospective exhibition a few years ago at the Museum of the City of New York and who designed a lovely mixed-use building on Park Avenue and 125th Street that was never built and has designed a high-rise apartment building that was nearing completion in 2010 on 45th Street in Manhattan between Fifth Avenue and the Avenue of the Americas. This building, which is also known as 23 Garfield Place and Garfield Sparta, not only has a wooden boardwalk leading to its front-yard entrance but also a nice cedar fence and Carroll Street. The building itself looks as if it would fit nicely atop a cliff in Puerto Vallarta or Portofino. One part of it has a slightly angled façade with long communal balconies and another part is set back further on the site with a slightly different façade treatment. 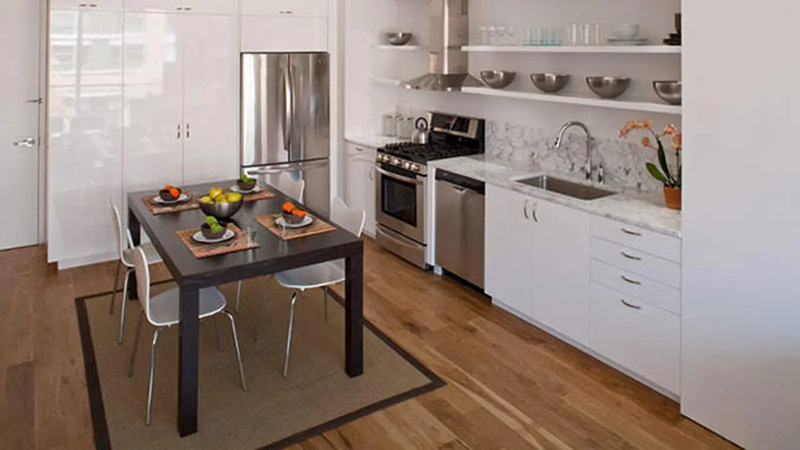 The open kitchens have LG refrigerators, Bosch EcoSense dishwashers, five-burner gas ranges with vented hoods, washers and dryers and marble countertops and backspashes. The building has a garage, storage units, central air-conditioning and a bicycle room and is pet-friendly. 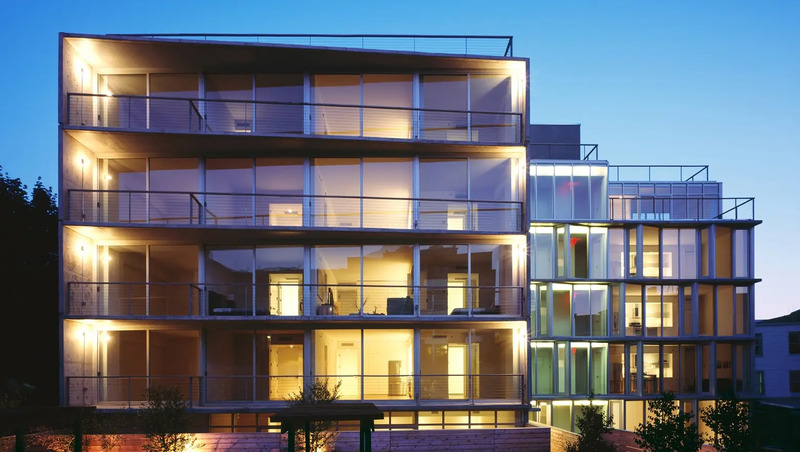 The building was developed by Sean Ludwick and an April 30, 2010 by Jason Sheftell in The New York Daily News said that it "brings a dimension that most neighborhoods beg for: a signature site by a world-class architect." 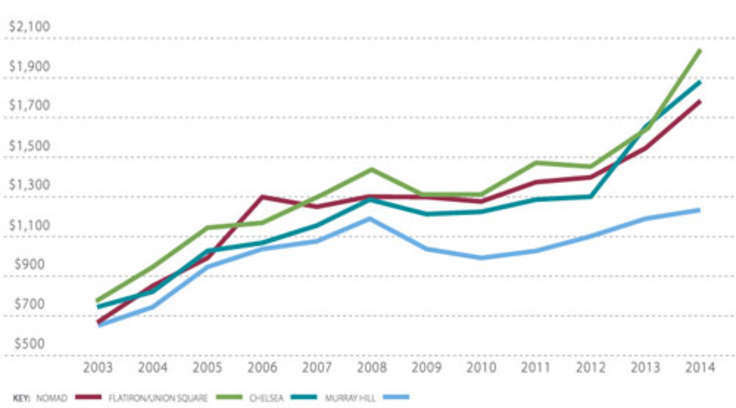 "It s Park Slope's turn now, which is a good thing for the neighborhood and for New York. It's about time people stop talking about baby carriages and problems with parking. It's about time they start talking about how boroughs, such as Brooklyn and Queens, are just as important a canvas for modern architecture as Manhattan, Buenos Aires, Shanghai or Paris. If this neighborhood wants to be on the map as New York's finest, then it has to look at this structure as crucial to its growth. It has to look past the butchery of Fourth Ave. by developers who put profit in front of quality, and pay attention to its most recently arrived development. So far, it has. Everyone who walks by 580 Carroll can't help but stare past the cedar fence up into the building's concrete, glass and steel façade. Sitting back from the street, the building makes a peaceful, quiet and strong statement, a simple study of materials in their most natural elements," Mr. Sheftell wrote, admiringly. "'I like the lightness of the building amidst the heavy, more historic structures on the street,' says Norten, whose firm, TEN Arquitectos, was tapped to design the Guggenheim Museum Guadalajara and the Reforma 296 tower in Mexico City. 'I want this to bring the spirit of hope, so the neighborhood is not condemned to look into the past, but can see a possibility for its future,'" the architect said in the article. "The glory of the façade is in its childlike shapes. A southern exposure on Garfield Place and the western portion of the north side of the building are triangular, angling out from the flat glass. Inside, each of the 17 units has a unique feel. Some are floor-through apartments with views to both streets. Others look onto Carroll St., which fronts the garden below. 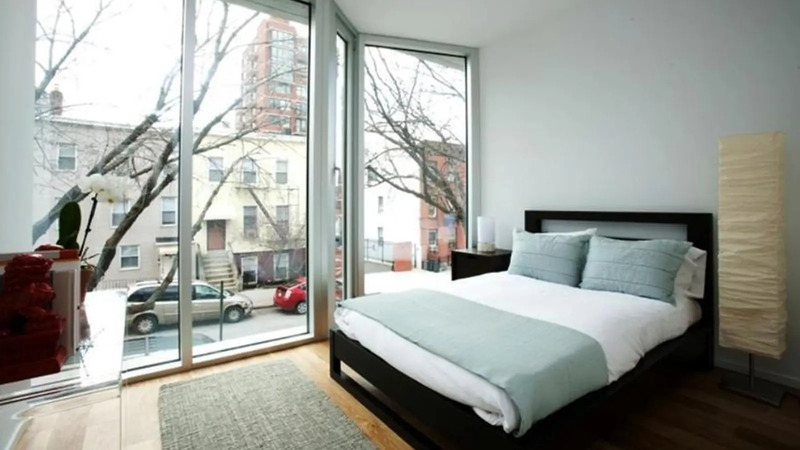 Almost every apartment has some outdoor space," according to the article. "Duplexes, one with a private entrance on Garfield Place, are sleek, minimal spaces with high ceilings and their own backyard spaces. An 11-car private parking garage sits under the structure. 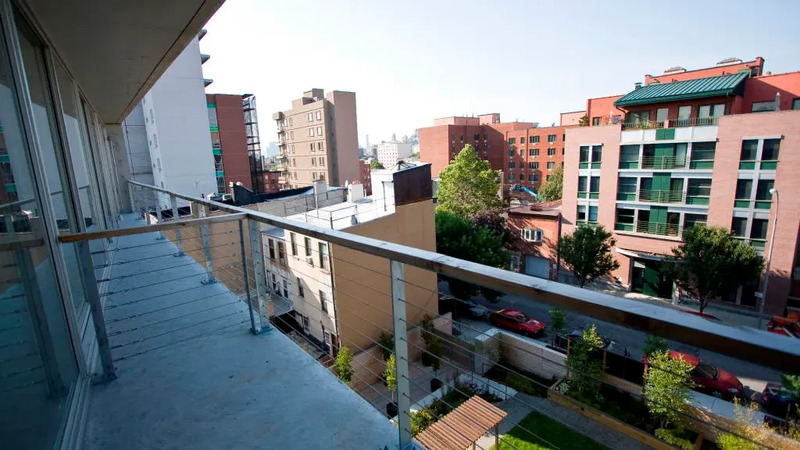 Thin wires serve as balcony barriers. 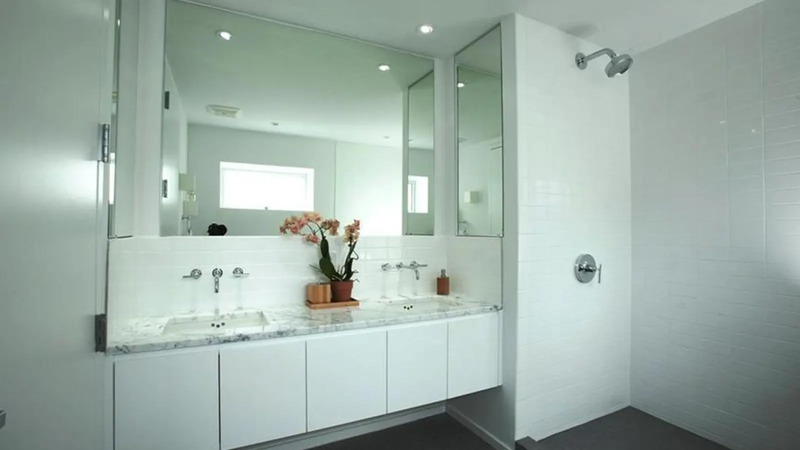 Some bathrooms are European in style, lacking a shower door," it continued. "There are people with a modern soul who live or want to live in this neighborhood," says Norten, who designed One York on Canal St. "They now have a place where they can live differently. It will also bring people to this neighborhood that have that same, contemporary vision." Mr. Norten, who has also designed One York Street in TriBeCa in Manhattan, described developers like Mr. Ludwick as "heroic for building different structures in New York," adding "it would have been so much faster and cheaper to build some brick building, like everyone else. But what does that add to a neighborhood? Nothing." "Ludwick," Mr. Sheftell wrote, "may not think he's a hero. Humble and hopeful, Ludwick will likely just break even on the building, where units range from $675,000 for a 910-square-foot, two-bedroom, two-bath apartment to $1.4 for a penthouse. When he started the project five years ago, the economy was different, and so was his profit margin. 'This building was not exactly a good business decision, but it will be an important architectural statement and a beautiful place to live,' says Ludwick, 37. 'Just getting this done, through the construction phase, was an incredible learning experience.' The site is Ludwick's first development since he branched out on his own with Ashwin Verma, forming BlackHouse Development Co. Born to a Flatbush, Brooklyn, father and a Peruvian mother, Ludwick speaks fluent Spanish - hence his connection to the Mexican-born Norten....'Park Slope is a smart neighborhood,' says Ludwick, who lost a zoning variance that would have allowed him to build three townhouses fronting Carroll St., paving the way for more profit. 'I wanted intelligent design. I just couldn't throw crap up here. At the end of the day, you want to do something good for a good place.'" The original design for the five-story building called for wooden louvers that could open an close but they were abandoned because of the recent fiscal crisis. 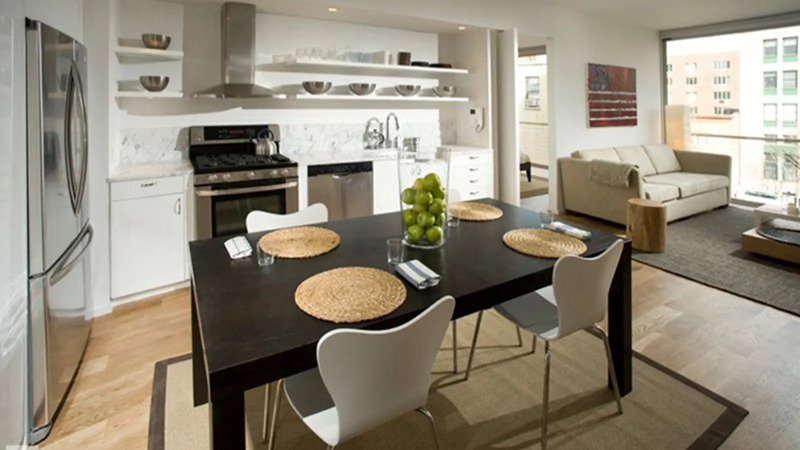 The apartments have 10-foot-high ceilings. Mr. Ludwick and his partners are also developing a hotel known as Habita along the High Line at 27th Street in Chelsea in Manhattan. An article by Peter Kiefer in the August, 2010 edition of The Real Deal said that the 10-story, 56-room hotel has been designed by Mr. Norten and that the same deal is also working on plans for another hotel on the Bowery. "The better summer beach houses in the Hamptons have nice, narrow, wooden boardwalks to traverse the terrain between the grand summer "bungalow" to the messy shifting of sand on the public beach. "Have a "Zen" garden out front and is unique in an otherwise uniform neighborhood. Back of the building on the Garfield side has a special design that covers the windows for improved privacy. It also has indoor parking."